Basic ingredients: Professional cook and food historian Ivan Day is passionate about the past on a plate. His re-creations of meals have appeared in museums on both sides of the Atlantic. 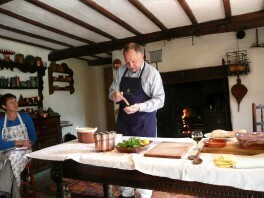 He also runs unique practical courses on period cookery, many of which take place in an historic kitchen in his own home, a 17th-century farmhouse on the edge of the Lake District. The kitchen has an extensive working collection of antique equipment dating from the 16th to the 19th century. Specialist weekend courses include Italian Renaissance Cooking, Regency Cooking, A Taste of Christmas Past and Period Ham Making. Baking, Pie Making, Sugarwork and Dairy and Ices are also on the sort of menu that would have heritage food buff Heston Blumenthal salivating. All courses cost £290 and include a Saturday evening historic supper cooked by Day, which might include such dishes as the Queen’s potage, potted Windemere char, spit-roast leg of Herdwick mutton and a medley of 18th-century English ices. We say: This is arguably Britain’s most unusual cookery school. Day’s website is a mine of information about books, events and jelly moulds.